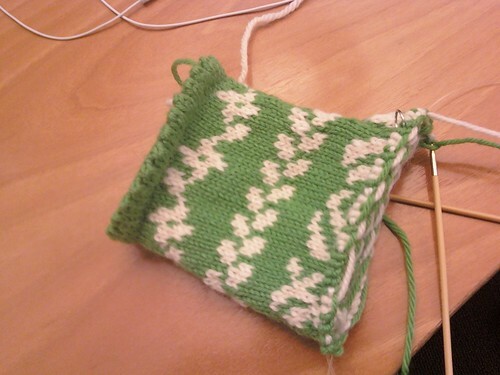 When was seventeen, I decided I wanted to learn how to knit. I looked up directions online, got really excited, and ran downstairs to find my mother and inform her of my plans. My apologies if you also read my wedding blog.. but this was too knitting related to not post here also! Yes, I’m going to try and knit my veil. I’ve ordered the yarn, but it’s on back order, so it’ll come in a few weeks. I had fallen in love with Handmaiden Lace Silk in their “Ivory” colorway – a gorgeous natural blend of beiges, creams, ivories, and whites. Really subtle and really gorgeous – and also really expensive. I knew I wanted some silk or shiny blend in their, to give it a beautiful glow, but I didn’t want to go broke either. I find WEBS has a yarn – a merino/tencel blend – that is light, shimmery, and beautiful. And it comes in cones! Perfect for huge lace projects! Plus, I’ll have extra yarn – so I won’t have to rip out my swatches to use. This will work out well for me because we’re going to experiment with dying the yarn to get that lovely hand-dyed look that the Handmaiden had. Lace dying party! I’m planning on knitting a square or circular shawl, and then folding it over about a third (so there will be a bottom layer that is longer than the top layer, and a straight edge to gather onto the comb), and attaching it under my hair (I’m going to wear my hair up). And, if in the end, it doesn’t work out? I’ll have a beautiful lace shawl, and we’ll by a veil. That’s why I’m starting it a little under 600 days out! As I mentioned, I’m going to remove the sash that came with my dress (a taupe that David’s Bridal likes to call “Latte”) and replacing it with a mint green sash. I knew I either wanted the shrug to match perfectly, or coordinate very well. When looking for yarn for the veil, I found this lovely gray/green (“Peridot”) colorway of Handmaiden Great Big Sea that looked great with the champagne color of my dress, and also had some of that mint green in there. It was different enough that it didn’t clash with the sash, but enough of the same that it didn’t look too crazy or out there. I couldn’t quite get the color right in these photos – the bottom is most accurate for the dress and purse, and the top is best for the yarn.. the yarn is not that dark or grey as it looks. That little purse is another wedding project I completed a few weeks ago, and is made using the same fabric as the sash for my dress will be. I spent a long time emailing patterns back and forth with Lindsey, and decided on the Posh Wedding Shrug. 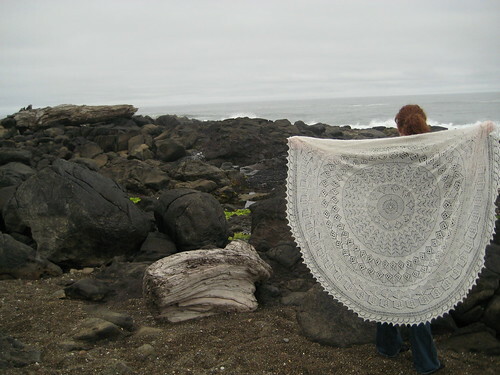 I love the length, it’s really easy to knit, and the lace pattern is just lovely. I’m undecided about adding the ribbon thread through the cuffs, but we’ll see. I also love the picot edging. I’ve finished one of the sleeves, and am almost done with the second – then I’ll graft them together, and knit the picot edging! Exciting! I don’t plan to wear this the entire time – I probably won’t wear it for the ceremony, but will put it on later (in case it’s cold at all), and will have some photos taken with it as well. Reason number 143 that Lindsey is so awesome: she offered to knit our chuppah. She said she had been intending to knit us an afghan as a wedding gift, and a chuppah really isn’t too far from that. This means a lot to me because I made the quilt that Ben & Lindsey were married under at their wedding this past summer (which reminds me that I have to finish the quilt for them!). I had to talk Dan into the chuppah, but he’s warming up to it slowly. I think it’s a beautiful wedding element. I’m still planning to knit the Best Ladies wraps, as their gift for being a part of our wedding. I need to get knitting! Hello, my poor neglected little knitting blog. 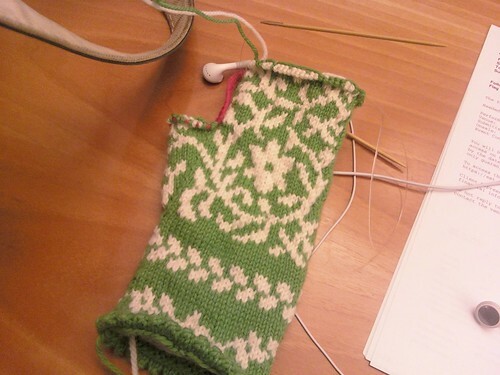 I am always knitting, but I guess I’m just not chronically it as obsessively as I used to. Part of it is working 9:00am to 6:00pm – it’s always dark when I want to take photos. So – if you would like updates on what is going on in my knitting and non-knitting life – here are two other places to find me, blog-wise. Because it’s always a great idea, when you’re not concentrating on one blog enough, to start two more. The first is my Celebrant blog. I’ll be back, don’t worry. I can never stay away from here for too long… no one else lets me talk about yarn this much. Unless I’m talking to Lindsey. I started the Bird in Hand Mittens on Tuesday evening and I’m so in love that I’ve been bringing it on my commute – crowded trains where I have to stand in the vestibule between trains, and have to switch after being on for about ten minutes – and knitting on the train. People have been looking at me like I’m insane as I carefully juggle the two colors, make sure the green is always carried above the white, and occasionally take out the worn chart to double check I’m doing it correctly. But it’s just so pretty.. that it’s worth the looks. Cascade 220 and Paton’s Classic Merino. US2 (2.75mm) bamboo circs. I never want the mitten to end. I’m actually looking forward to the next one! I left off the braid, and will either do some embroidery or a crochet chain on when I’m done.. I haven’t decided yet. In honor of an impending Lindsey visit, here’s an Etsy Friday! I have a dumpling problem. I mean – it’s not like my pink cat nose problem (the single most adorable thing in the world! 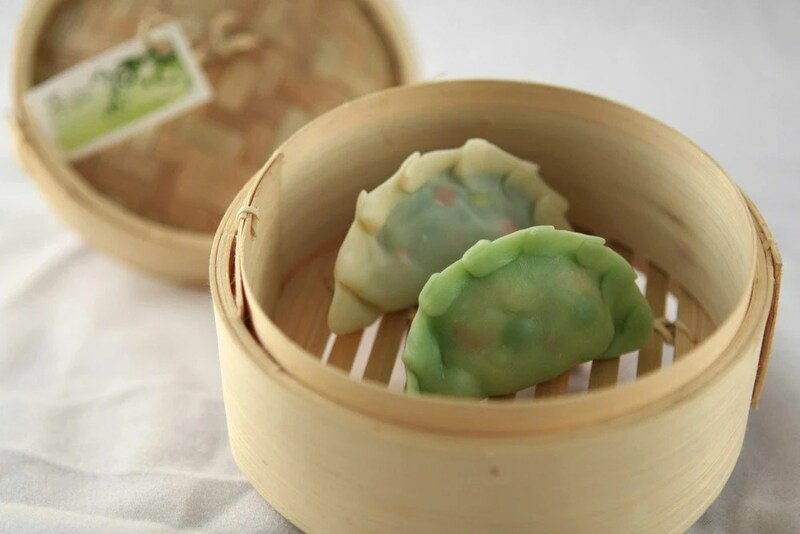 ), but I do love almost any kind of dumpling – pot stickers, shumai, pierogie, ravioli, wontons… take a little bit of dough and wrap it around a filling, and I’m in (in fact, I don’t like shrimp, but will eat shrimp dumplings). And to make it even better – Lindsey is visiting this weekend, and we are planning a House marathon and a dumpling tasting, with some knitting thrown in – can you imagine a better weeked? This happy little dumpling brooch just makes me smile! 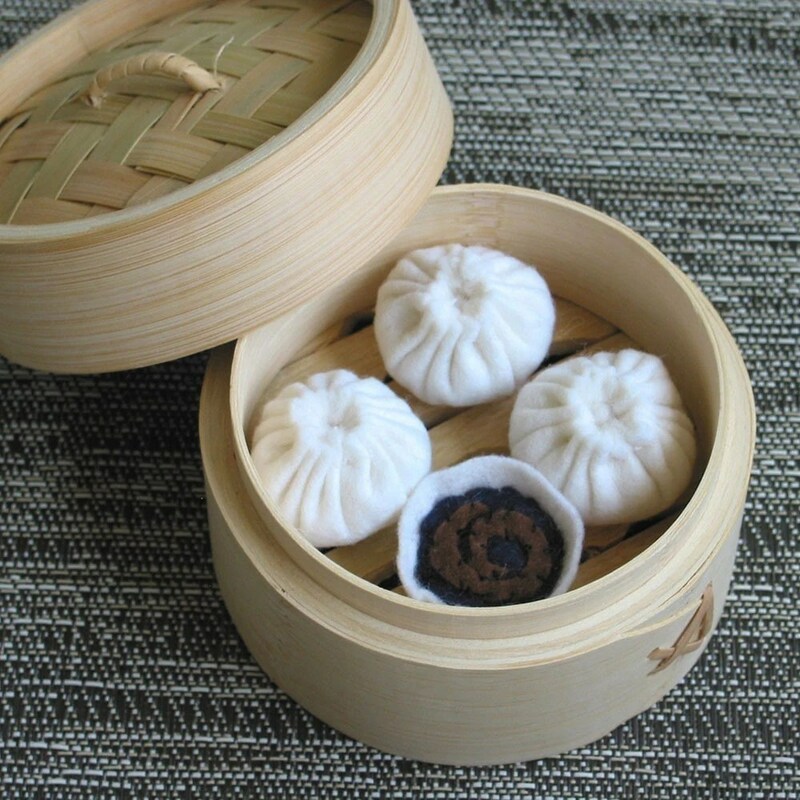 These dumpling magnets are so realistic looking that they are reminding me I haven’t had lunch yet… perfect to hold your Chinese food menus on your fridge! In addition to cat noses and dumplings, I also have a fascination with fake food. I got it from my mom, I think. 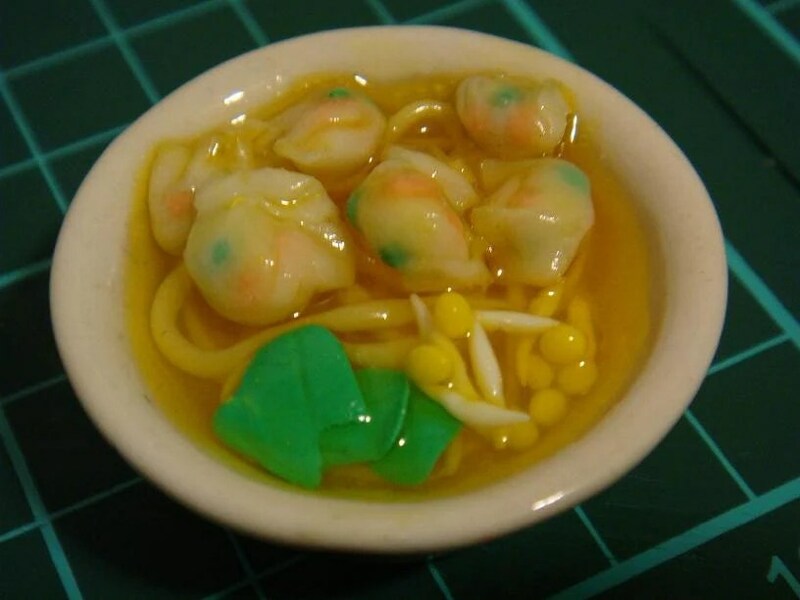 Doesn’t this little mini bowl of soup with wontons and noodles adorable?? 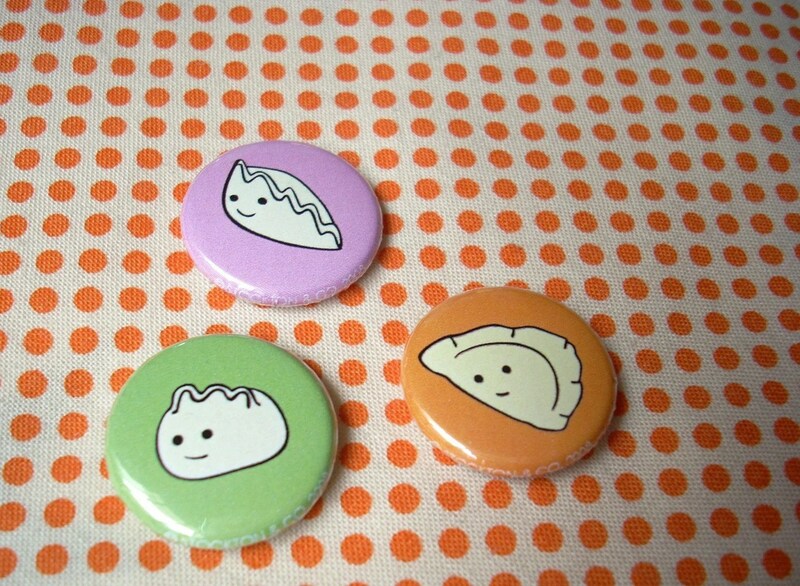 Wear your dumpling buttons with pride – Team International Dumpling gives you a few to choose from, so you can show wear your favorite! There’s even a little soy sauce dish for dipping! 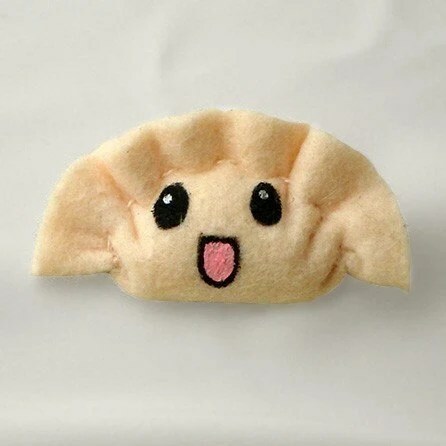 She has a ton of other great dim sum felt favorites in her shop, too! 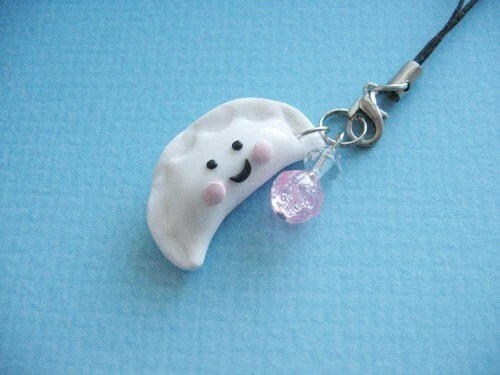 Who wouldn’t want a little smiling dumpling cell phone charm? 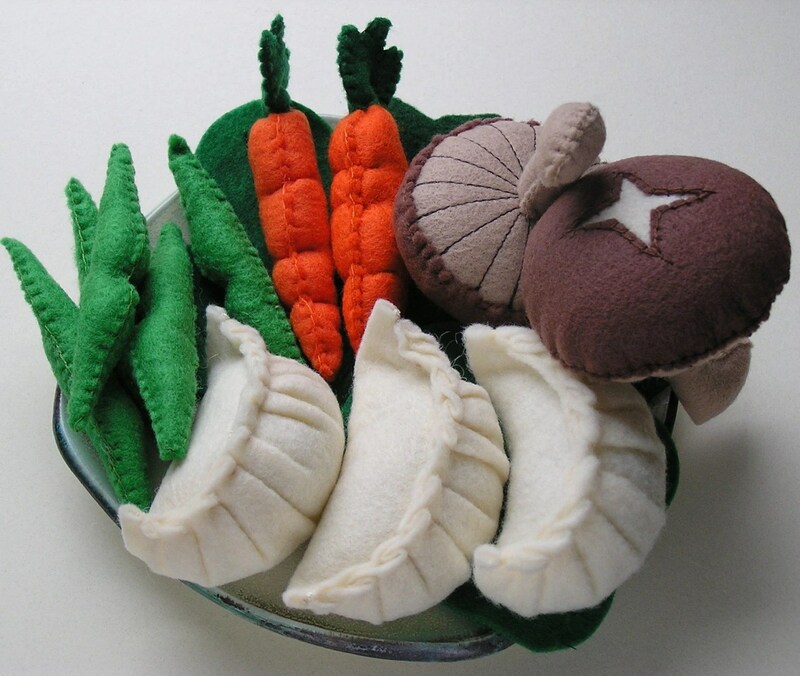 This full dumpling meal of felt is incredible! Now I want my dumpling filled weekend to start already! Please check out today’s Questionable Content for a little bit of knitting humor. Well, simply because you can. I love making costumes. I always have. I don’t get many oppurtunities to make them anymore (post my high school Ren Faire phase and costume designing theatre productions in college). When Lindsey invited me to her Halloween party, I knew I had to make a great costume! I went with Princess Peach (nee Toadstool) from Super Mario Brothers. I went with her “classic” appearance, mostly because I couldn’t find a good pattern that had the little Cinderella style side poofs in her recent appearances. I was planning to dye my hair strawberry blonde pre party, but ran out of time, and wasn’t too into finding an appropriate wig. The dress itself is adapted from McCalls’ 4948. I made the bodice with no overlay, and the short poofy sleeves. The pattern had two lengths for the skirt, so I cut the large skirt piece apart at the “shortening” line, and cut the lighter pink from the upper portion and the darker pink from the smaller portion, at the bottom. I also used the dark pink as the band on the sleeve, and sewed a sash to wear as well. I know the colors aren’t exact – there aren’t many fabric stores near me, and I ended up ordering the fabric online, and my budget and fabric choices limited my color choices. I found a nice heavy polyester satin that was really reasonable, and these were the best color interpretations that I could do. The gloves were purchased from Amazon. 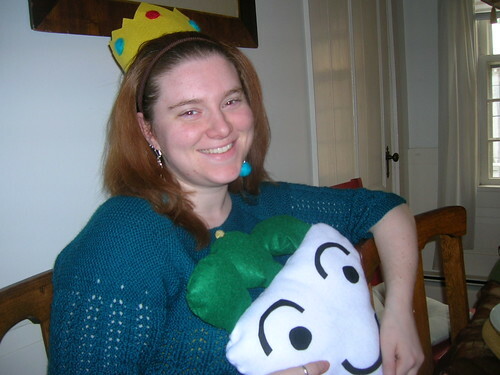 The radish is sewn out of felt. The crown and brooch are felt, with needle felted details! Lindsey made me Princess Peach inspired dangly felted earrings! All the accessories, ready to go! 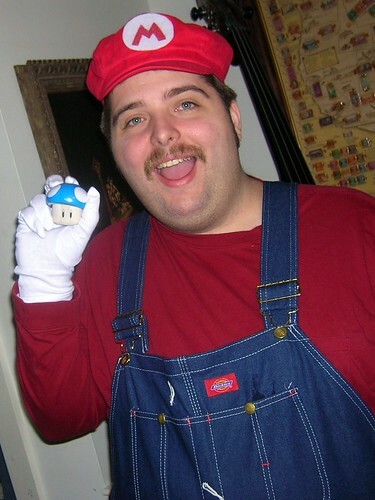 And what’s Princess Peach without Mario?